[prMac.com] Toronto (Ontario, Canada) - Agile Web Solutions today announced the release of 1Password 2.7, which introduces a completely new feature that allows you to instantly log in to web sites. With one key combination or mouse click you can navigate to a web site, fill in the login details, and submit the form. This is accomplished using a new Bookmarks window that is integrated into the web browser, providing quick and easy access to all your 1Password logins. This update is free to all paid 1Password customers. 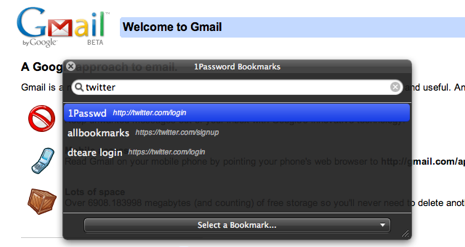 * Convenient: There is no need to install anything extra or launch 1Password just to access your 1Password bookmarks. * Fast: The new Bookmarks window is built right into your web browser when you install 1Password's browser extensions and opens without delay. * Easy: Open the new Bookmarks window with a single mouse click or keyboard shortcut. * Full Keyboard Access: Finding bookmarks and logging in can all be accomplished from the keyboard without any need for the mouse. * Distinctive: 1Password's new Bookmarks window uses a semi-transparent window which looks different from your browser window, making it easy to identify and it doesn't get lost. For full details about the new release, including the change log and screenshots, visit the official company weblog. A single-user license costs $34.95 USD and a family license is available for $49.95 USD. 1Password may be downloaded from the company website. A fully functional 30-day trial version is available, along with a free version limited to 20 items. Special media licenses are available for members of the press and the blogging community upon request.